The Bureau of Refugees, Freedmen, and Abandoned Lands, also known as the Freedmen’s Bureau was established in 1865 to assist newly freed African-Americans and displaced whites following the Civil War. The Freedmen’s Bureau provided freed African-Americans and whites with shelter, food, employment assistance, and education. The Freedmen’s Bureau is considered the first federal agency devoted to the social welfare of Americans. Why was the Freedmen's Bureau Established? In February of 1862, abolitionist and journalist George William Curtis wrote to the Treasury Department suggesting that a federal agency be established to help formerly enslaved people. The following month, Curtis published an editorial advocating for such an agency. As a result, abolitionists such as Francis Shaw began lobbying for such an agency. Both Shaw and Curtis assisted Senator Charles Sumner draft the Freedmen’s Bill—one of the first steps to establishing the Freedmen’s Bureau. Following the Civil War, the South was devastated--farms, railroads, and roads had all been destroyed, and there were an estimated four million African-Americans who had been freed yet had no food or shelter. Many were also illiterate and wanted to attend school. Congress established the Bureau of Refugees, Freedmen, and Abandoned Lands. This agency was also known as the Freedmen’s Bureau in March 1865. Created as a temporary agency, the Freedmen’s Bureau was part of the War Department, which was headed by General Oliver Otis Howard. Providing assistance to both African-Americans and whites who were displaced following the Civil War, the Freedmen’s Bureau offered shelter, basic medical care, job assistance and educational services. Just one year after its establishment, Congress passed another Freedmen’s Bureau Act. As a result, the Freedmen’s Bureau was not only going to present for another two years, but the U.S. Army was commanded to protect the civil rights of African-Americans in former Confederate states. However, former President Andrew Johnson vetoed the bill. Soon after Johnson sent Generals John Steedman and Joseph Fullerton to tour sites of the Freedmen’s Bureau. The purpose of the generals’ tour was to reveal that the Freedmen’s Bureau was unsuccessful. Nevertheless, many southern African-Americans supported the Freedmen’s Bureau because of the aid and protection provided. Congress passed the Freedmen’s Bureau Act for the second time in July of 1866. Although Johnson vetoed the act again, Congress overrode his action. As a result, the Freedmen’s Bureau Act became law. What Other Obstacles Did the Freedmen's Bureau Face? Despite the resources that the Freedmen’s Bureau was able to provide to newly freed African-Americans and displaced whites, the agency faced many problems. The Freedmen’s Bureau never received enough funding to provide for people in need. In addition, the Freedmen’s Bureau only had an estimated 900 agents throughout southern states. And in addition to the opposition that Johnson presented in the existence of the Freedmen’s Bureau, white southerners appealed to their political representatives at the local and state levels to end the work of the Freedmen’s Bureau. At the same time, many white northerners opposed the idea of providing relief solely to African-Americans following the Civil War. What Led to the Demise of the Freedmen's Bureau? In July of 1868, Congress passed a law that closed the Freedmen’s Bureau. By 1869, General Howard had ended most of the programs associated with the Freedmen’s Bureau. The only program that remained in operation was its educational services. The Freedmen’s Bureau closed completely in 1872. Following the closing of the Freedmen’s Bureau, editorialist George William Curtis wrote, "No institution was ever more imperatively necessary, and none has been more useful." 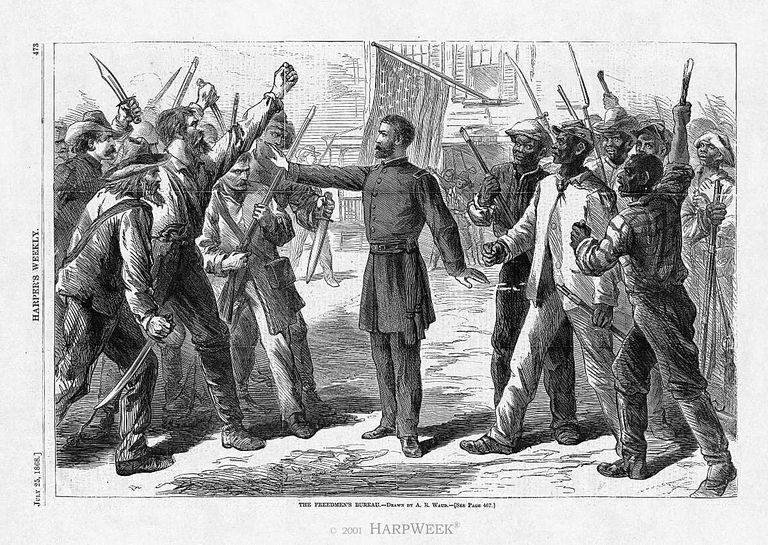 Additionally, Curtis agreed with the argument that the Freedmen’s Bureau had averted a “war of races,” which allowed the South to rebuild itself following the Civil War.